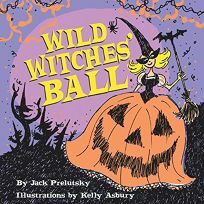 Wild Witches' Ball, Jack Prelutsky's refurbished rhyme from Witch Poems (1976), counts down a coven convention with new illustrations by Kelly Asbury. ""Ten tall crones"" precede ""nine queer dears with pointed ears,"" and soon there are ""witches squeezed in every nook/ whichever where you cared to look."" Scrawly sorceresses in a thick, fuzzed black line appear against backgrounds of purple, orange and hot yellow. (Aug.) .